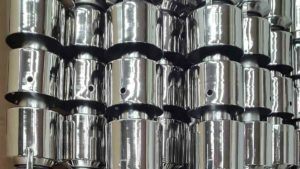 Nickel plating is obtained by converting the nickel of the anode into nickel ions that then pass into the nickel plating solution. These ions are discharged on the surface of the cathode (the piece to be plated), where they are again converted to nickel. The discharge of nickel ions on the cathode is not the only possible reaction and, in fact, a small percentage of the current is also used for the discharge of hydrogen ions. The yield of the nickel deposit is thereby reduced by 3-7 per cent, compared to 100 per cent that would occur if all the current were used to deposit nickel atoms. If the hydrogen ion concentration of the solution increases (low pH), the discharge of hydrogen ions also increases, that is, hydrogen gas develops at the cathode, and the deposition rate of nickel decreases. In normal conditions, the yield of the nickel dissolution at the anode is of 100 per cent and there is no discharge of hydroxyl ions. If, however, the pH is high, there can be a discharge of hydroxyl ions instead of the dissolution of nickel with the development of oxygen, which makes the anode passive and modifies the distribution of the current between anode and cathode. This can affect the quality of the nickel deposit and it is, therefore, important to employ materials such as Nickel ‘S’ or anodes capable of resisting to passivation, as well as to supply the solution with nickel ions within a wide range of operating conditions. The amount of nickel that can be deposited on the cathode within a certain time and with a certain current is determined by natural laws that regulate the rate of reaction to the electrodes. In round numbers and in perfect operating conditions, this means that a current of 27 amperes would deposit 29 grams of nickel in one hour. In practice, however, since part of the current is used for secondary reactions, such as the development of hydrogen, the amount of deposited nickel is about 28 grams. If the deposition rate is expressed, rather than by weight, in terms of thickness of the deposit produced in a certain time, 12 microns of nickel are deposited on a surface of 1 square decimetre by the passage of a current of 1 ampere for one hour. In an ideal nickel plating solution, nickel would move from the anode to the cathode (the piece to be plated) in such a way to create a deposit with identical thickness on each part of the cathode. This, however, happens very rarely. 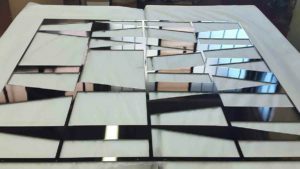 Each solution has its own electrical resistance, and almost every piece to be nickel-plated has some prominent parts, whose surfaces are closer to the anode, and some recessed parts, more distant. The current flowing from the anode to the prominent surfaces will, therefore, be greater than the one going to the hollowed surfaces, namely the current density in amperes per unit area will be greater in the prominent parts, due to the lower electrical resistance of the section between the anode and the cathode, because of the shorter distance. Such distribution of current during nickel plating is referred to as current distribution. This means, inevitably, that the hollowed surfaces receive a less thick nickel deposit, compared to the prominent surfaces. 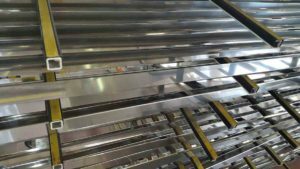 Much can be done to improve the uniformity of the deposit with a careful design of the piece and with careful placement of the pieces on the nickel plating frames. Ideal anodes should not contain impurities and should dissolve completely, with no residues. They should also operate within a wide range of solution pH and current density (that is, being highly active, depassivated, or depolarized). In Watts solutions, in the presence of chloride and with normal pH and current density, all nickel forms are dissolved with a yield of 100 per cent. This means that a well-determined weight of nickel (1.094 grams) is dissolved with the passage of 1 ampere per hour. 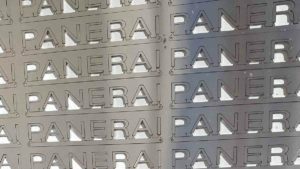 Given that, except in case of passivation, there are no secondary reactions, the nickel plating solution is always stocked with nickel ions at a constant rate that depends only on current and time. The first experiments with different forms of refinery nickel immediately indicated that, in some cases, the metal loss was unacceptably high and electrolytically refined nickel proved to be the best material. In practice, there are always some residues and the use of anode bags is essential. When anodes must be removed from the bath, it is important that the extraction occurs slowly to avoid agitating any residues, and that the anodes are not placed on the floor but hanged by their hooks. A large amount of residues is evidently a loss for the person in charge of the nickel plating, especially if it contains nickel-metal fallen from the anode during dissolution. This solution, which forms the basis of most solutions for glossy nickel plating with organic additives, is economical, simple and easy to control. Its purity is also easy to maintain. Nickel sulphate is the primary source of nickel ions, but a higher deposition rate can be obtained by increasing the concentration of nickel chloride. These solutions contain additives that alter the formation of the nickel deposit to produce a perfectly glossy surface, on which chrome can be deposited without intermediate polishing. In the past, this was obtained by adding formates and formaldehyde cobalt salts to the bath, but in modern patented solutions, a mixture of organic additives is employed to give brighter deposits within a wide range of current density. Since 1950, it has been paid particular attention to the corrosion resistance of decorative deposits. The first glossy deposits were quickly attacked by corrosion after short periods of use. The research on corrosion causes and deposits inefficiency, however, led to the introduction of nickel plating systems ensuring both the required glossy finish, and a satisfactory service life when exposed to the corrosive action of the weather. In polished nickel deposits, part of the additive molecules is deposited together with nickel, giving it a hard, fine grain texture. The deposit usually contains sulphur which somewhat reduces the corrosion resistance, compared to the one of a semi-glossy or matt nickel deposit, free from sulphur. The decomposition products of the additive that remain in the solution are removed by purification in a continuous cycle on activated carbon. With a careful choice of additives, galvanic materials suppliers have produced patented solutions from which impurities are selectively eliminated with the indicated treatment. 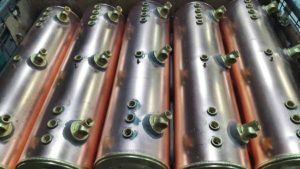 To decrease the time of nickel plating in drums, apparent current high densities must be employed and, therefore, glossy nickel plating solutions are needed. These solutions are, e.g., Watts solutions with patented brighteners added. 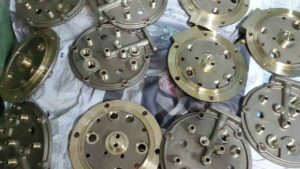 They are of two types: (a) High chloride glossy nickel plating solutions that can operate with voltages of 12-16 volts to give high current densities and short nickel plating times. The deposit receives the chromium plating very well, but on pieces with sharp edges exfoliation may occur. The colour of the nickel deposit may tend to yellow. (b) High sulphate glossy nickel plating solutions, which, due to the lower conductivity than high chloride ones, must operate with higher voltages, comprised between 12 and 20 volts.